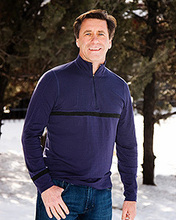 Paul Gervais started his CPA firm in 1992 in Denver, Colorado. His standard for excellence and enthusiasm for his work led the firm's growth and continues to do so today despite his unexpected passing in March of 2018. Paul loved his work and loved his clients just about as much as he loved his small mountain town of Durango, and skiing, hiking and biking with his wife of 32 years, Catherine, and his three daughters, Leah, Abby and Ellie. Though he is greatly missed, his memory and vision continue to carry on throughout the firm. "Learn how to learn. The tax profession is one of constant learning and knowledge gathering. Your undergraduate degree taught you perhaps 5% of what you need to know to succeed as a tax CPA. You will never learn the entire remaining 95%, but the harder you try, the more successful you will be. Technology will dramatically change your relationship with knowledge. It won't be just what you know, but rather how quickly you can retrieve critical answers and effectively communicate the finer details. You need strong relationships with three mentors - (1) a successful person within your profession that is at least 15 years your senior. This person will save you much time and effort. (2) God, or whatever power in the universe you believe in, to help with the heavy lifting and bumps in the road. (3) tequila!"